Would you like to give your Blogger blog a fresh coat of paint with a new theme? Here’s how you can use the new Template Designer to make your Blogger site stand out from the crowd and look great. Although it’s not mentioned online as much as newer blogging platforms such as WordPress.com and Tumblr, Blogger is still a very popular blogging platform since it’s free, easy to use, and integrated with Google apps. 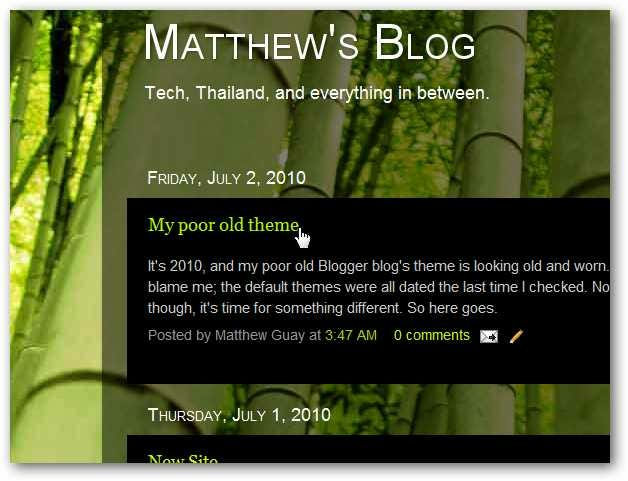 However, Blogger’s themes often looked rather dated, and and it was difficult or impossible to get a truly professional or even modern look in Blogger. Now, however, that has changed. 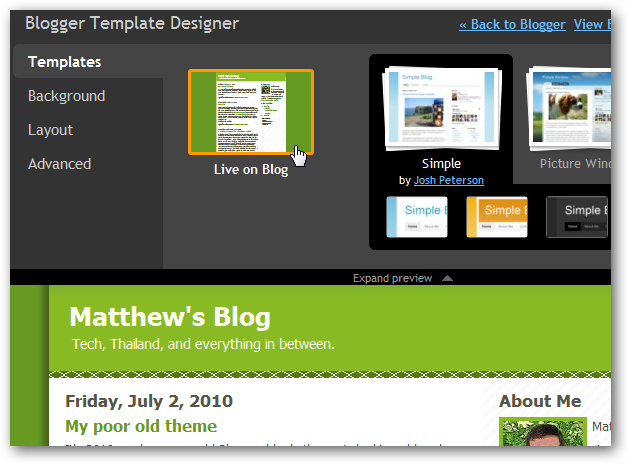 Blogger has been recently revamped with a new Template Designer. This lets you quickly select from several nice, modern layouts, and even customize them with color palettes and stock photographs and artwork. Let’s look at how you can customize your blog and create a unique style quickly and easily in the new Blogger Template Designer. 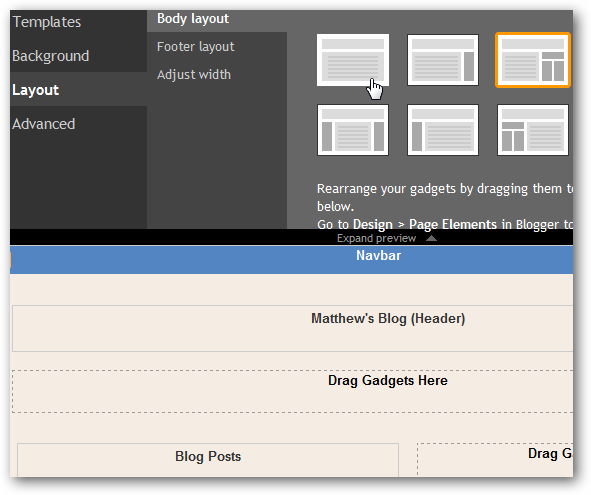 When you login to your Blogger Dashboard, you may see a new popup showing off the new Template Designer. Click the Try it now button to get started. 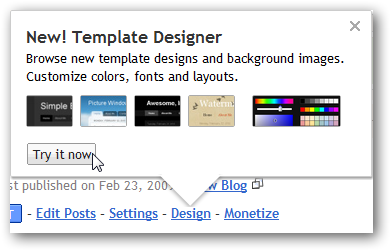 Otherwise, select the Design tab in your Dashboard, and then click the new Template Designer link. This will open a brand new template page that shows the new theme options on the top, and your existing blog design at the bottom. Let’s do something about that old design. First, from the Template tab, select a new Theme set, and then choose one of the available variations underneath. If you don’t see one you like, click the right arrow to reveal more themes. Currently there are 6 theme sets, but each one offers several variations. Once you select a theme, you’ll immediately see the changes on your blog preview on the bottom of the page. It’s looking better already. If you like the default theme style, you can go ahead and save your changes, or you can continue on and change the colors and background if you like. Select the second tab on the top left to change the background and color scheme. 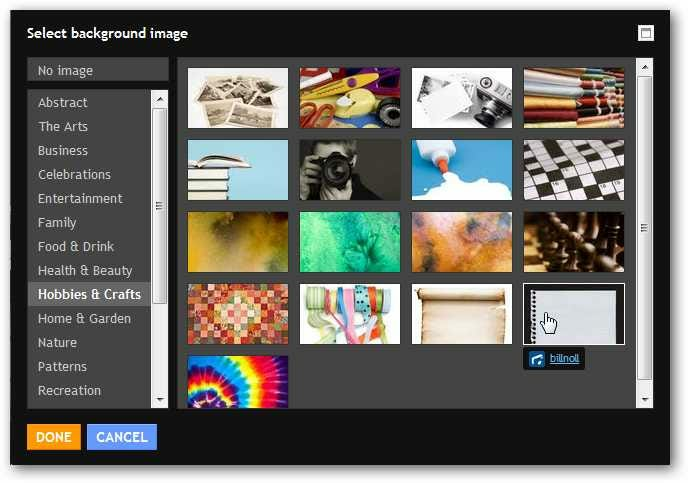 Click the Background image button to select from a wide variety of nice, free backgrounds from iStockPhoto. Select a category on the left, and then click the picture you want to use to apply it to your blog. You’ll see the changes immediately in your blog preview; if you like it, click Done, or go back and pick another if you’d like. Back on the Background tab, you can select a premade color palate, or click the top button to choose a different base color. Note that Blogger will automatically switch your color scheme to match the background you picked, but you can still customize it if you like. Now, you can change your blog’s layout to customize it even more. Click the Layout tab on the top left, and select a new layout. Notice that your blog preview on the bottom of the page will change to the old Blogger designer view, and you can drag and drop elements to the place you like as before. Finally, if you’d like to customize fonts and colors on your Blog template, select the Advanced tab and then select the part of your blog you’d like to customize. You can even add custom CSS to your theme from the Add CSS tab. You can see the changes immediately in the blog preview underneath, which is a great way to make sure you’re changing it the way you like. This lets you really customize your theme as you like. Once you’re done tweaking your new theme, click Apply To Blog in the top right corner. Now, open your blog in a new tab. If you like your new theme, then you’re all set; otherwise, go back and tweak some more until you’re content. Blogger has seemed like one of the least feature-full blog platforms for awhile, but with the new Template Designer, your Blogger blog looks great even beside more modern blogging platforms. If you’re starting a new blog, you might want to try out several platforms to see which one you like best. Now you can be sure to have a great theme, even if your site is running on Blogger. Let’s get all the old Blogger blogs updated with the new themes!